OrCAD is an electronic design automation (EDA) and circuit simulation tool that provides designers with a number of flexible options. OrCAD PCB design package contains schematic capture, PSPICE simulator, PCB designer, etc. OrCAD PCB design was developed and owned by Cadence Design Systems Inc.
OrCAD PCB Designer can be used to design up to 14 layers complex multilayer boards. 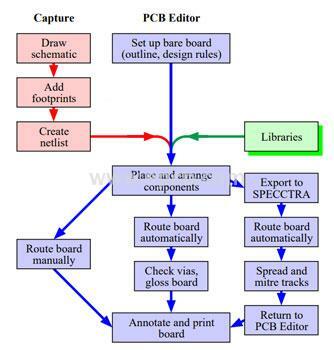 PCB design in OrCAD starts from schematic and through separate tools for assigning footprints and annotation the design ends up in routing the PCB. The schematic is drawn on the editor of OrCAD PCB Designer's schema capture window. The component library, power sources and analysis tool library can be used to make schematics. 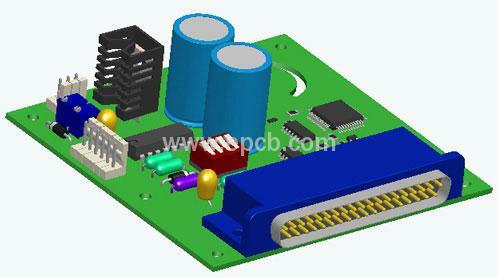 The schematic diagram will be used as a reference for creating a PCB file. By using the integrated SPICE simulator in OrCAD PCB Designer, the schematic diagram can be a simulator for analyzing output and input characteristics. A natural or simulation scheme is mentioned in the project creation window to optimize the simulation. Components are assigned with a suitable footprint as required. And then generate a netlist involving component and footprint information to start your PCB design. Initialize the OrCAD PCB Designer by setting board properties, names, etc., and use the netlist for importing the schematic into the PCB editor. The components are rearranged to a preferred position to be fixed. The traces are routed manually or through the built-in automatic routing algorithm. You can set routing properties in the Design Rule Check option. For the convenience of the designer, various routing tools can be used to route the external path. OrCAD also includes 3D models and real-time 3D viewing options to enhance the design experience.